Sheraton Dubai Creek Hotel & Towers - 5 star hotel is perfect for business and leisure travelers alike, located in the 'heart' of Dubai with the combination of the old and the new city experience. A renovated 5-star landmark hotel with magnificent views overlooking Dubai's historic Creek and famous skyline, the Sheraton Dubai Creek Hotel & Towers has extended warm hospitality to its discerning guests for over 40 years. It is conveniently located near the city's main commercial and shopping districts, the Spice, Gold and Textile Souks, Union Metro Station, as well as the Yacht Club. "Everyone was pleasant and accommodating. The hotel was beautiful, clean and the maid service was the"
All rooms were well maintained. The buffet breakfast was very appetizing and had something for everyone and never seemed to run out. The pub had great fish and chips along with other beverages. The location was good for shopping at the gold and spice souks. It was very safe and clean all around the hotel with a great pool area. I would suggest this hotel for anyone wanting to stay in Dubai. 09-Apr-2019 Verified Review, stayed from Sun Mar 31 to Sun Apr 07 2019 at a Dh550.00 group rate. An iconic structure located on Dubai's historic waterway since 1978, the Sheraton Dubai Creek Hotel & Towers continues to be the destination of choice for the social and business traveller. 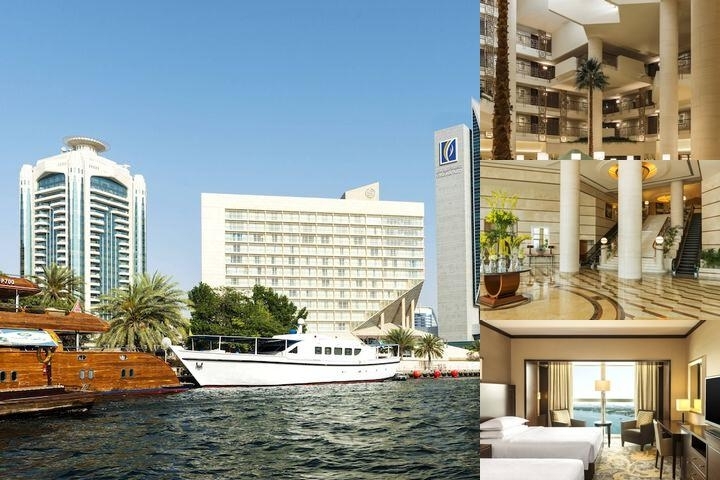 Leading the way in revitalising the cultural and historic district of Dubai Creek and its surroundings, the hotel offers guests a look at 'Life at the Creek', encompassing everything that this notable area has to offer. Following a complete renovation in 2015, the Sheraton Dubai Creek offers a modern, elegant look with the same familiar Arabic touches and hospitality the Hotel is renowned for, across 268 comfortable and contemporary rooms with spacious bathrooms and complimentary WiFi. Sheraton Club rooms and 30 expansive suites offer travellers heightened luxury, in an indulgent escape inclusive of Sheraton Club Lounge access and rooms located on higher floors, providing spectacular views of the Creek and striking Dubai skyline. With award-winning international cuisine on offer and several of Dubai's best restaurants on site, the Sheraton Dubai Creek has a range of world-class dining and lounge options to suit any taste and budget, from high quality Italian at Vivaldi by Alfredo Russo, the explosive tastes and aromas of Indian dining at Ashiana, a theatrical live cooking and interactive dining experience at Creekside Japanese Restaurant, as well as contemporary all-day dining at Hatta, Dubai's oldest British pub fare at The Chelsea Arms and small bites and snacks 24 hours a day at the Lobby Café. Local Shuttle Info: Our complimentary shuttle bus can take guests to Dubai Mall and Al-Mamzar Beach park. For Dubai Mall it leaves the hotel every day 12pm, 3pm and 6pm and leaves Dubai Mall at 3:30pm and 6:30pm. Valet Parking is complimentary at our hotel for guests staying in house or using the facility of the hotel. We can guarantee 100 parking spaces for big events - any additional spaces are subject to availability. Wi-Fi is free at Sheraton Dubai Creek Hotel & Towers - in the conference rooms you can access Sheraton-Conf, and Sheraton-Guest everywhere else.